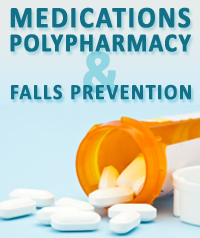 The effects of medications on falls has been a topic of much discussion, both in research and practice. For a while we have known that certain medications increase the risk of falls, but people may need to be on these medications which makes it difficult to consider withdrawal, although there may be a chance to discuss medication timing and dosage. We have also known for a while that being on four or more medications increases the risk of falling, although there is some debate over whether it is the potential interactions between medications or whether four or more medications is really just an indicator of multiple medical conditions and hence risk of falls could be more related to the effects of the medical conditions than the medications themselves. The following articles provide an overview of the issues involved by reviewing a selection of research publications, exploring interventions in practice and finally providing a list of online resources that may help in your falls prevention practice.